I've been meaning to post this box for ages, bit late. Oops! Want to try your first box free and get a second half price? You don't even have to stay signed up after the free box! Click here and use the code LMJJNZ2. I love these dipper punnets and they're bringing new ones out soon. I was unsure of this when I got it. Pear and apple chutney? I don't like pears but its not too sweet, just the right amount of tang to go with the flatbreads, which I love. I love anything covered in seeds though. I hate sultanas and raisins. I can eat white grapes by the truck load, I've been trying to eat them when I get them sent to me but I just can't. The strawberries and pineapple however, bit of an odd combination but tasty non the less. Cheese cashews are ... Odd to say the least. I wasn't a fan. Loved the rest of it, made a change to have something savoury. But the cheesy cashews were a definite no from me. Loveeeee! Definitely one for when you're craving something sweet. Delightful crunchy. 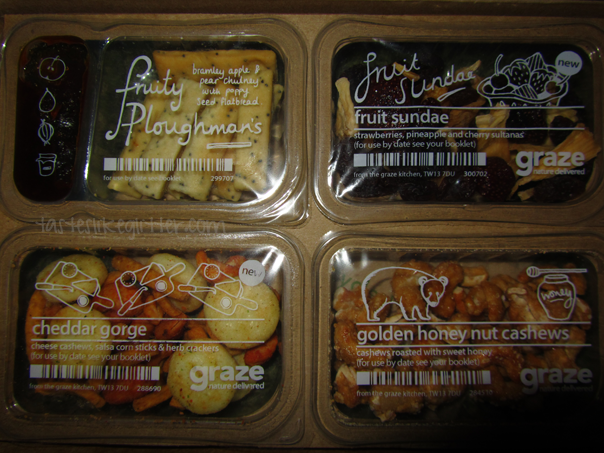 Not usually a fan of entire punnets of nuts but this was yummy but they were far too sweet for me to finish them all. I've been a bit too poor to be getting them weekly. I miss my Tuesday delivery but hopefully that will change soon.